Its major export partner is Switzerland. Its main exports are gold, cotton, and livestock. Its major import partners are Cote d'Ivoire and France. Its major imports include capital goods, foodstuffs, and petroleum. Located in Western Africa, Burkina Faso has a 3,611.00 km border with Benin (386 km), Cote d'Ivoire (545 km), Ghana (602 km), Mali (1,325 km), Niger (622 km) and Togo (131 km). Burkina Faso has several unresolved boundary alignments with its neighbors, including Mali and Niger. The capital city of Burkina Faso is Ouagadougou, located in the central part of the country, near the Green Belt of the Centre Region. The name of the city is often shortened to Ouaga, and the people who live here are known as Ouagalais. The climate of Ouagadougou is classed as a hot semi-arid environment that can also exhibit characteristics of a tropical wet and dry climate. The rainy season in the city takes place from May-October, with the heaviest precipitation taking place between June and September. 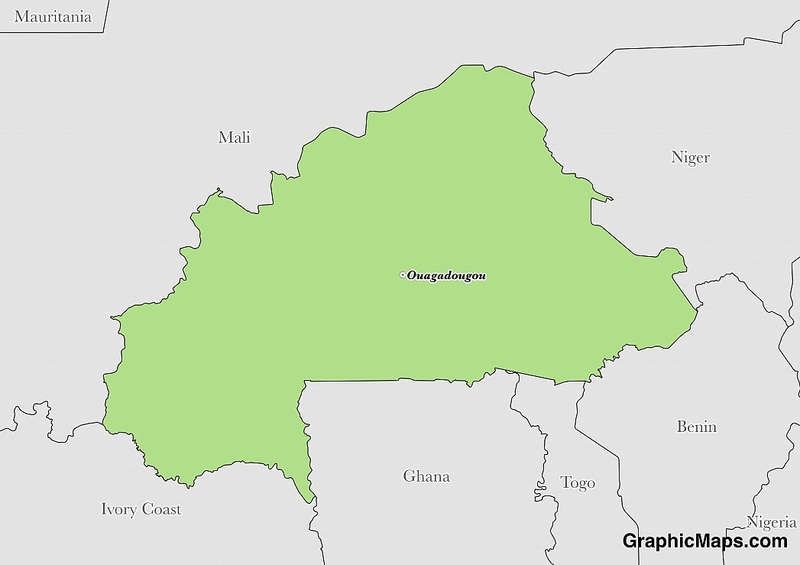 The population of Ouagadougou is estimated at just over 2.3 million citizens, many of whom live in the city region. The city covers an area of 219.3 square kilometres (84.7 square miles), and the surrounding metropolitan area encompasses an area of 2,805 square kilometres (1,083 sq miles). Burkina Faso is an African country covering 274,200.00 km2 of which 0.15% is water and 273,800.00 km2 is land. This makes it the 74th largest country in the world and slightly larger than Colorado. Its geographic coordinates are 13 00 N, 2 00 W and Ouagadougou is the capital city. The name of the country roughly translates to "Land of the Honest Men". Its ISO code is BF. Burkina Faso has a mean elevation of 297 m above sea level. It has a tropical climate with warm, dry winters and hot, wet summers. Its terrain is mostly flat with some hills in the west and southeast. Burkina Faso has a population of 19,512,533 making it the 59th largest in the world. French is the official language. The majority ethnic groups reported are Mossi, Fulani, Gurma, and Bobo. The population is mostly Muslim and, to a lesser extent, Christian. Burkina Faso is considered a multilingual nation with estimates putting the number of living languages in the country at over 70; 66 of these are indigenous to Burkina Faso. 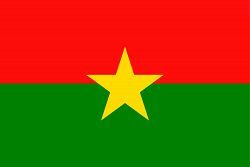 The official language of Burkina Faso is French which has been considered the formal method of communication in the country since the 1919 French colonisation. The most common language in the nation is the Mossi language. Roughly 40% of the population use Mossi as their primary tongue. This language is most prevalent in the Centre Region which is also the most populous area and contains the capital city Ouagadougou as well as being a common language in the neighbouring countries of Ghana, Mali, and Togo. There are approximately 7.5 million ethnic Mossi in the country today. The dialing code for the country is 226. Burkina Faso is an independent country. It gained independence from France in 1960. Its constitution was last ratified in 2002. The political system of Burkina Faso can be described as a semi-presidential republic. The Prime Minister is the head of a government in a multi-party system, and the President is considered the head of state. Burkina Faso elects their parliamentary representatives and president every five years. Both positions serve five-year terms. The country is divided into 45 electoral provinces within the 13 regions, each province elects two to nine representatives (depending on size), and these elected individuals are part of a political party. The parliament of the country is known as the National Assembly of Burkina Faso and is located in the capital city of Ouagadougou, located in the Centre Region. This parliament is home to 127 elected members of the government. The country has experienced attempted or successful coup d'etat in 1966, 1980,1982, 1987,1989, 2014, and 2015 which gives a sense of how volatile the political landscape can become in Burkina Faso. Factoring in Purchasing Power Parity, Burkina Faso's GDP is $32,990,000,000.00 (USD) with $1,800.00 (USD) per capita. This makes it the 127th largest economy and its citizens the 200th richest in the world. The currency of Burkina Faso is the Franc (XOF). Its major export partner is Switzerland. Its main exports are gold, cotton, and livestock. Its major import partners are Cote d'Ivoire and France. Its major imports include capital goods, foodstuffs, and petroleum. The flag of Burkina Faso consists of two equally sized horizontal fields, one red (top) and one green, with a five-pointed yellow star in the center. This flag was officially adopted by the country on 4 August 1984 after a coup in which Thomas Sankara gained power. The original designer of the flag is unknown but has been widely recognized that the government of Sankara during the 1980s pushed this design to the forefront of the nation as a prominent symbol of independence. Red, green, and yellow are popular Pan-African colors which are often used to renounce a colonial past and additionally signifies unity with other African nations. This flag is a stark contrast to the previous flag of the region. The most recent flag of Burkina Faso before the current version was the original flag of Upper Volta, adopted after the country gained independence in 1960. This flag contains three horizontal stripes of black, white, and red.